The Sugar Glider Apartment is a great home for your glider due to the extra height and two fun shelves. 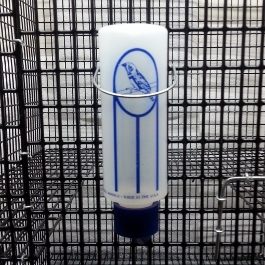 Sugar Gliders like a cage that offers climbing space. Height is a good thing to a Sugar Glider. 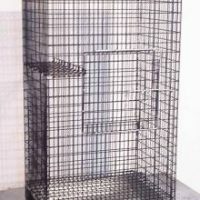 So this cage is called the Sugar Glider Apartment, and it is 18’x18’x36′ and it comes with a peaked roof, with a dormer. The cage inside has two shelves, one on the right at about a foot and the one on the left is about 20” up from the floor. 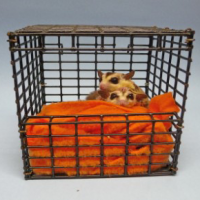 Gliders can easily hop from one to the other, as well as climb to the peak of the cage. A few toys, ropes, branches and a wheel, and they are off to the races. 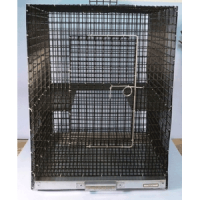 The cage door is large enough to easily add and remove the Wodent Wheel, which is a great source of exercise, as well as nail trimming for your gliders.